People these days love shortcuts. The world moves at a terrifying pace, and you can either cheat your way to the top or get left behind with the "it's not the destination, it's the journey" crowd. No one wants that. Even a century ago, our ancestors were struggling with the very same problem. 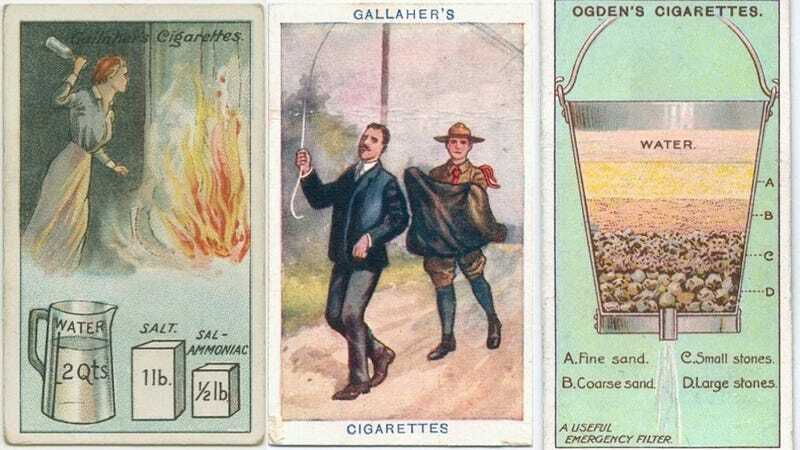 And their trusty neighborhood cigarette supplier—Gallaher's Cigarettes—was ready to answer the call. Before refrigerators, nothing kept your eggs fresh quite like a tasty salt bath. Want to spice things up? Replace the salt bath with bath salts. Last one to cannibalize their neighbor is on dish duty! Wild dog attack? Just grab the nearest ten-foot bamboo pole. The dog in front will be distracted by the disguise while the dog in back will be distracted by your vulnerable, delicious friend. Run fast! Dogs eat quickly. The ol' palm hickey trick. Great for getting out splinters, even better for making sure that your lady or gentleman caller knows you hold good hand. Need to light a match in the wind? blocking with your hand is only mildly effective; it's best to increase surface area and make sure the whole thing catches fire. Bonus life hack: third degree burns are great for garnering sympathy. Whenever you pass by a middle-aged man-about-town grabbing onto rogue telephone wires just so he can feel alive again, make sure to sneak up on him with your blanket/burlap sack from behind. Everyone loves surprises. Make sure you filter any questionable drinking water thoroughly. Wouldn't want anything to contaminate that pure, Ogden's Cigarettes-flavored mouth we've worked so very hard to create.